Physical stop prevents dump carriage over rotation if pivot limit switch is damaged. 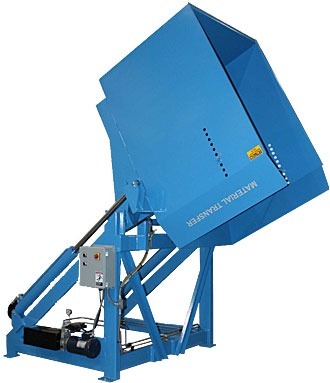 Heavy plate steel dump bucket with reinforced loading floor. Ten (10) position adjustable container hold down system. Carbon steel cleaned, then painted MTS Safety Blue using a two-part epoxy finish. 3 GPM hydraulic system with MTS exclusive two-speed circuit. WHY MTS BRAND CONTAINER DUMPERS? Reduced employee strain and labor costs, increased operational productivity.